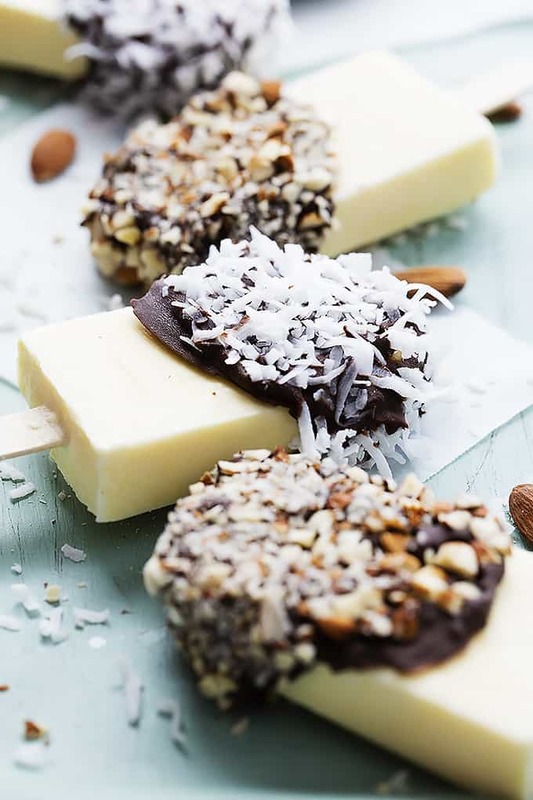 Creamy, frozen Coconut Almond Popsicles coated in chocolate and sprinkled with chopped with crunchy toasted almonds and shredded coconut flakes! Sooooo popsicles. I grew up a serious ice cream addict – I get it from my mom’s side. I dearly love a giant soup-bowl sized portion of ice cream topped with hot fudge, caramel sauce, and sprinkles. If I had even a smidgen less self control than I do (not very much so that’s sayin’ something) I’d have ice cream every day. For breakfast, lunch, and dinner. And snack. It’s really all I can do to keep myself from buying or making tubs and tubs of ever-lovin’ ice cream and stockpiling them in the giant currently empty freezer in my garage. 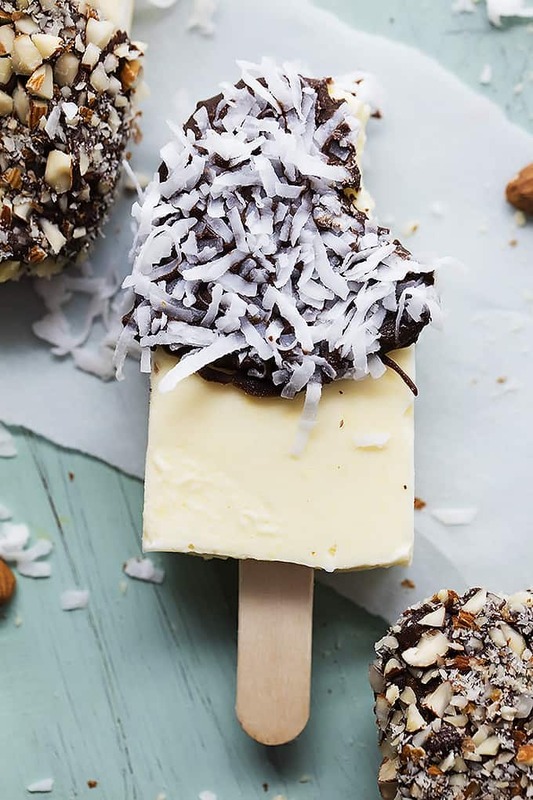 Popsicles are a little bit different than straight up ice cream, particularly in texture. But the frozen creamy goodness part of both treats speaks to me. And for some reason I’ve craved popsicles over ice cream every day during my pregnancy. Every single day I want a popsicle and trust me, they’ve been consistently stocked in my house this summer. I’ve even gotten my husband hooked on a nightly popsicle while we watch re-runs of How I Met Your Mother. 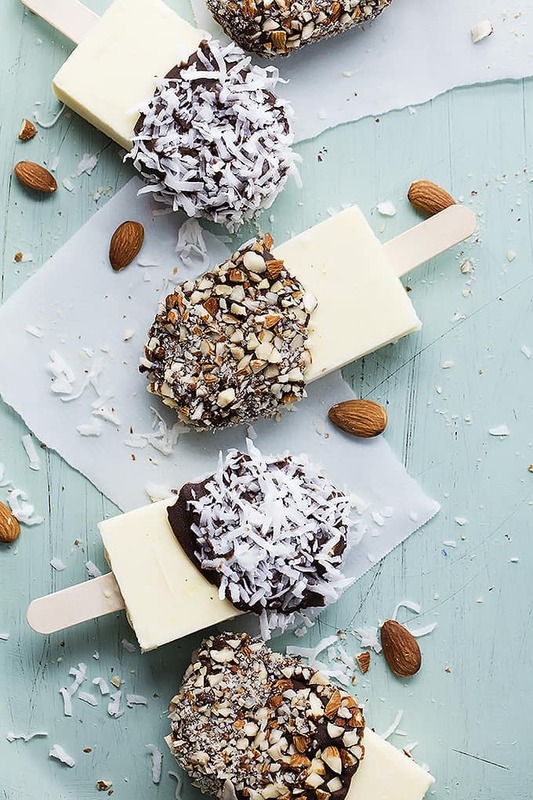 These coconut almond popsicles have been a guilty pleasure for me this summer. 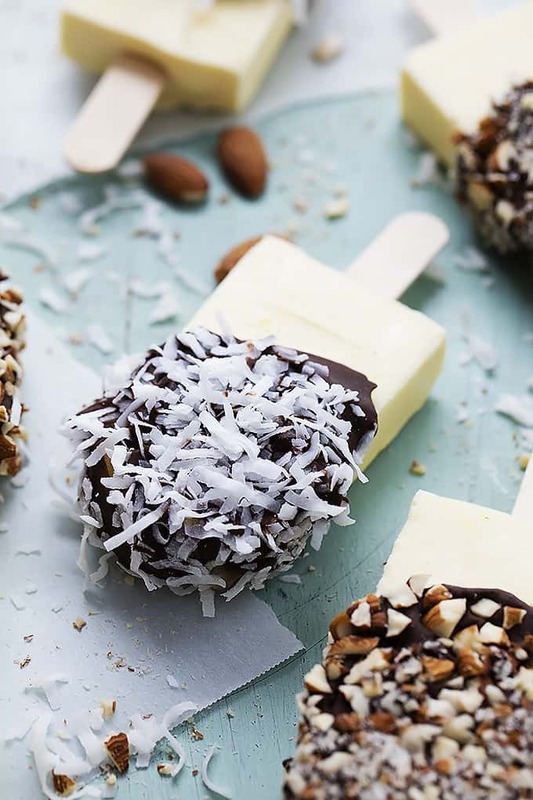 Coated in chocolate and topped with crunchy almonds and sweet coconut flakes. I love that flavor combo – coconut & almond. Plus chocolate. Chocolate seals the deal. I know that summer is coming to a close but I’m choosing NOT to pay attention and just pretend that popsicle season will go on forever. So if you’re on board with that, you should join me in whipping up a batch of these beauties. Rest assured they are EASY. Just 5 ingredients. Plus some coconut and almonds for the topping if you want. And you do want, because look how purrrrrrdy! 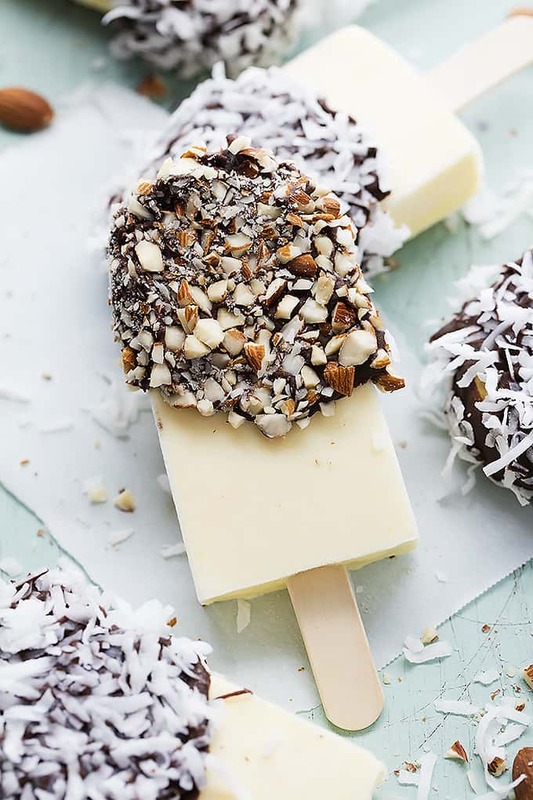 Creamy almond and coconut flavored frozen popsicles coated in chocolate and sprinkled with chopped with crunchy toasted almonds and shredded coconut flakes! In a medium bowl whisk together the 1 cup of heavy cream, milk, pudding mix, and almond extract. Pour mixture into popsicle molds. Freeze for 4 hours or overnight. Line a small baking sheet (something that will fit in the freezer) with nonstick foil, set aside. In a microwave-safe bowl combine chocolate chips and 2 tablespoons heavy cream. Microwave on half power for 2 minutes. Stir, then return to microwave on half power for 20 seconds at a time stirring after each until smooth. Run the popsicle molds under warm running water to loosen the popsicles. 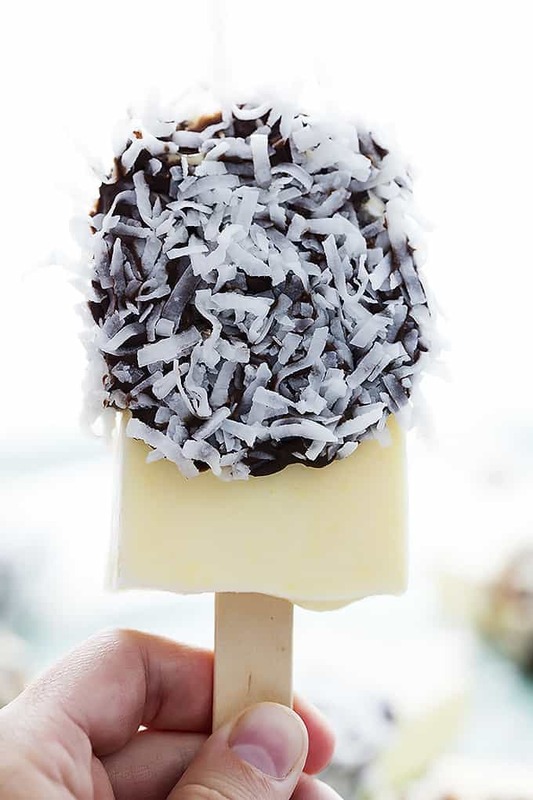 Dip popsicles in melted chocolate, then immediately sprinkle with shredded coconut flakes and/or chopped almonds. Place on prepared foil-lined baking sheet and return to freezer for about 5 minutes or until chocolate cools. Store wrapped individually in plastic wrap in the freezer. 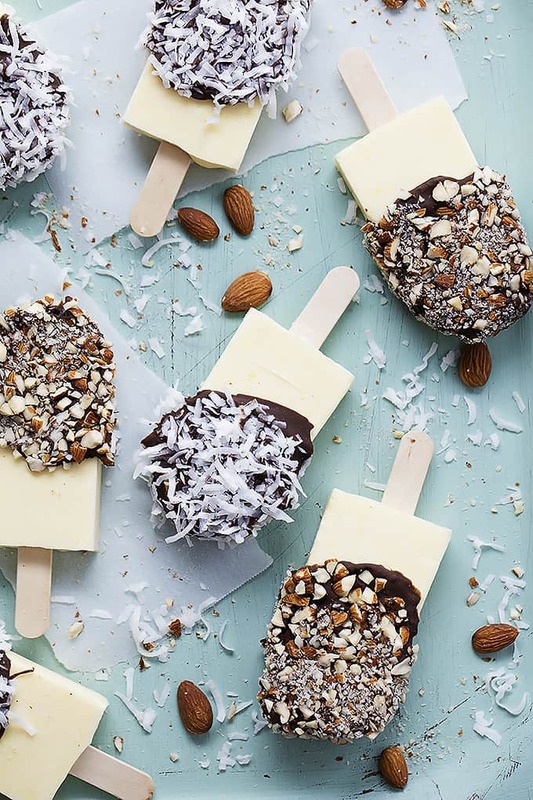 Try these other Popsicles you'll love! Oh, now this is ice cream I can eat w/o feeling guilty about the calories. oh yummy! !these look really good! 5 Ingredients to coconuty creamy deliciousness? I WANT THAT. 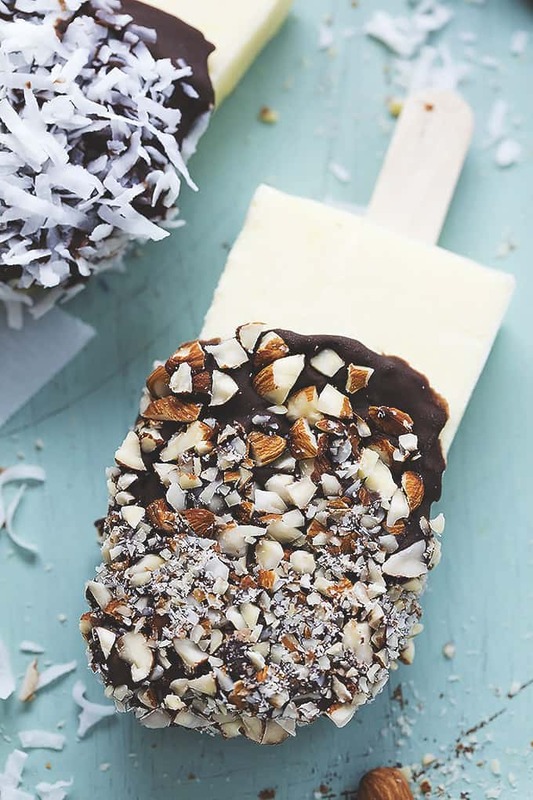 I love popsicles over ice cream…almost as much as I love How I Met Your mother 😉 Pinned! AGREED! Haha – we love that show, I laugh every dang time. I like how thick the layer of chocolate is on these popsicles! The more chocolate the better! Haha! !